The first time I heard of this soup was an episode of the sitcom Seinfeld featuring the "Soup Nazi". Now I know what all the commotion was about. This is a soup with a definitely delicious flavor. Mulligatawny is a curry-flavoured soup. Mulligatawny means "pepper water". 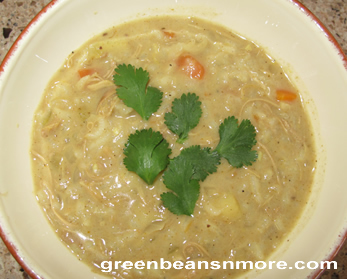 This is the perfect leftover turkey soup recipe and one that's a favorite in our household. Despite it's exotic name "Mulligatawny", it doesn't require any exotic ingredients. Everything you need can easily be found in your local grocery store. (McCormick offers garam masala sold under their "Gourmet Collection" which most stores carry, or you can order garam masala online). Try this Turkey Vegetable and Noodle Soup recipe from Emeril. It's another delicious way to use left over turkey. We found this fabulous recipe on Chowhound.com. It's a great way to use the left over turkey and homemade stock from Thanksgiving. This recipe makes a thick and hearty soup. This recipe can be made using chicken stock (which is the classic recipe). It's a rule in our house that we never eat any soup the same day it's made. An overnight in the refrigerator gives flavors time to meld together. Do yourself a favor, make this soup a day ahead of time, you'll get the best flavor that way. Melt butter in large pot over medium heat. When it foams, add onion, season with salt, and cook until tender, about 3 minutes. Add apple, carrot and garlic, stir to coat in butter and season again with salt. Add freshly ground black pepper. Saute until apple is tender and onion is translucent, about 5 minutes. Sprinkle flour, curry powder, garam masala, cumin and cloves over the vegetables and stir until the spices are fragrant and the flour has cooked slightly, about 2 minutes. Slowly add stock, stirring until flour has dissolved. Bring to a simmer and cook until the vegetables are tender, about 10 minutes. Add turkey, COOKED rice, coconut milk and lemon juice and return to soup to a simmer for about 10 minutes. Stir in lemon zest, if using and season with additional salt and freshly ground black pepper as desired. Garnish with cilantro and serve. Cook's Tips: Make sure you cook the flour and spices for at least 2 minutes as called for in the recipe. Don't rush this step and stir the vegetables the entire time. I only added one cup of the stock to dissolve the flour. When the flour was totally dissolved and the stock thickening I added the rest. I think it's easier to tell if the flour is incorporating well in a smaller amount of liquid. I would suggest you make the final addition of salt and pepper, and decide about adding lemon zest AFTER the soup has sat for a day. The flavors change incredibly - for the better - if the soup sits (refrigerated) overnight. This soup is quite thick. Add chicken stock if you need or want to thin out the soup. When serving a very small squirt of lemon juice helps to freshen it up and a dollop of sour cream (which goes great with the cilantro) has a nice cooling effect. A side note: Before I made this soup the first time I read the comments left by others who had made it. Some people chose to change the recipe, leaving out key ingredients (one person made it without garam masala). The first time I prepare a recipe I always follow instructions and NEVER leave an ingredient out. That is the only true way to measure how good a recipe is.